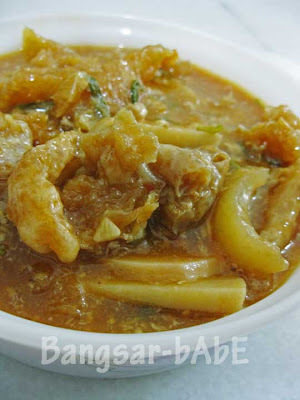 As I mentioned in my earlier post, my favourite Hock Chew food is the sweet & sour fish maw soup (khor rhew hai rheng). Nobody does it better than my mum. Call me biased, but I grew up eating and loving every mouthful of it. 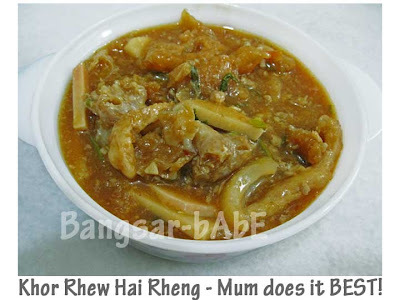 Mum patiently fries the khor rhew until it is light and crispy, before adding it into the sweet & sour soup. The essential ingredients for this delightful dish is bamboo shoots, minced pork, sea cucumber, carrots, chives, egg & kampung koh chili sauce (I think!). I came home from work last week and was greeted by its delicious aroma. Without putting down my bag, I quickly made my way to the kitchen and saw mum fussing over the stove. She scooped me a bowl, and I tucked in with utter delight. My dad likes his fish maw slightly chewy (undercooked) while I like mine airy and light. Mum tries to please us both, so she takes half the fish maw out 5 minutes earlier for dad and leaves the rest to fry for me. Looks well worth fighting tooth and nail for! I haven’t seen this anywhere! Since I don’t want to have to fight you to get to your mom’s, where would I suggest I go for a commercial inferior version? 550ml – Orient Delights in TTDI Plaza sells it too. I haven’t tried it, but my parents have. My dad still likes my mum’s version better. They also have the red wine mee suah and foo chow fish balls.